We loved Elizabeth Anne and Jared from the first time we met them over a cup of coffee. They are super chill and easy going, very funny and so easy to talk to! We had been looking forward to getting to spend more time with them during their engagement session, and it certainly didn’t disappoint! The brought their adorable corgis with them to the shoot, and some serious cuteness ensued. You’ll see what we mean below! Their pups, Cooper and Butters, are pretty much Instagram famous (For real! Check out @corgi_brothers on Instagram! ), so they were pros when it came to posing for the camera. They must have learned it from their mom and dad, because Elizabeth Anne and Jared are quite the engagement session rockstars as well! 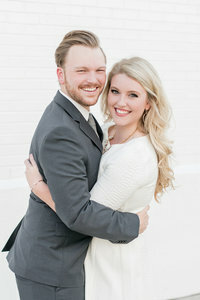 Elizabeth Anne and Jared are tying the knot at “their place,” Children’s Harbor at beautiful Lake Martin, this weekend! We can’t wait to get this show on the road!